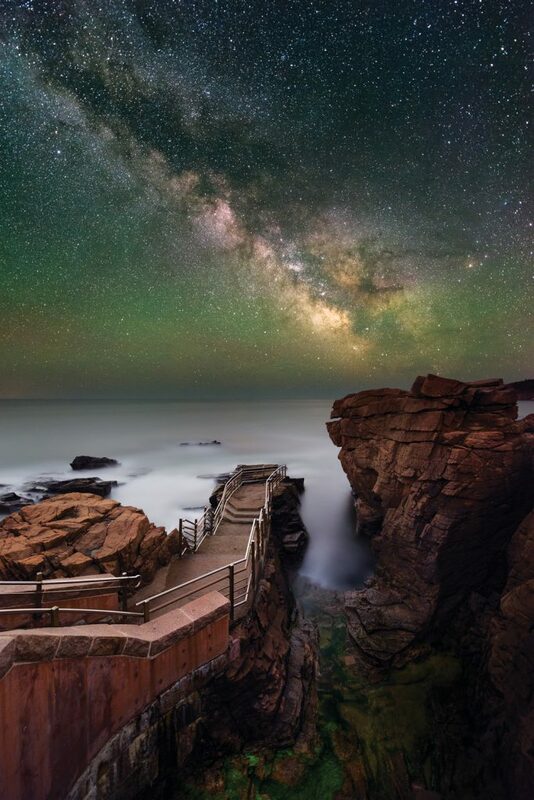 To find Acadia’s purest wilderness, just look up to behold the largest expanse of naturally dark sky east of the Mississippi — a credit to both the National Park Service’s policy of preserving natural lightscapes and the town of Bar Harbor’s dark-sky ordinance. The sight of a sky swimming with billions of stars (plus scores of fast-moving satellites — alas, it’s not totally wild) is so rare in this light-polluted world that it’s cause for celebration: amateur and pro astronomers descend on MDI for night hikes, lectures, and star parties atop Cadillac Mountain during the annual Acadia Night Sky Festival. Over all the wind made moan. Ah, such a stormy day at great Thunder Hole. — A poem by Ann Chaplin, age 10, printed in The Horn Book Magazine in July 1943. One of Acadia’s best-known attractions, the rock inlet called Thunder Hole — and the waves that often crash into it — inspires awe (if not poetry) from millions of visitors each year. See more from our Best of Acadia guide! Get our Acadia Wall Calendar, a great take-home souvenir for travelers venturing to Acadia this summer and those who just appreciate the beauty of the region.